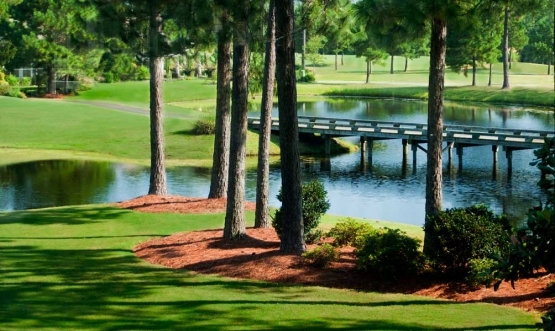 Sandpiper Bay has long been a favorite Myrtle Beach golf course for locals and tourists alike. This 27-hole Dan Maples design is both challenging and fun. Located just a short drive from North Myrtle Beach, Sandpiper Bay is the ideal course to include on your Myrtle Beach Golf Authority golf package. The “Sand” and “Piper” nines are the original 18-holes and they feature rolling fairways that wind through the natural forests and water hazards. The greens are surrounded by bunkers and water hazards alike. The “Bay” nine has abundant water and bunkering as well. The natural setting is the ideal spot to view some of Sandpiper’s wonderful wildlife such as fox squirrels, fox, rabbits, a wide array of birds and of course gators galore. Sandpiper recently renovated their greens with Mini Verdi Bermuda grass and roll very true. Golfers of all skill levels enjoy this wonderful course. Myrtle Beach Golf Authority golf packages offer the best Myrtle Beach golf deals with their huge variety of North Myrtle Beach hotels, condos, and ocean front beach houses. Myrtle Beach entertainment comes alive in North Myrtle Beach when the world famous beach clubs on Main Street open up. The mild Myrtle Beach weather makes a stroll along the Ocean Drive Section of North Myrtle Beach a very memorable experience. It is time to book your Myrtle Beach golf package. Sandpiper is a very good course and usually in very nice condition. There are three 9's at Sandpiper. The Sand and the Piper are my favorites. I play it a lot and always have a great time.